Marc reflects upon, contrast and compare the 1968 Baltimore riots following the death of the Rev. 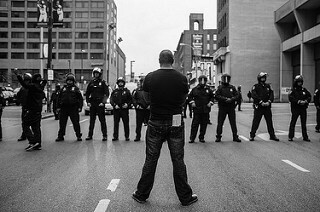 Dr. Martin Luther King, Jr., and the 2015 Baltimore Uprising. With: Dominique Stevenson, Program Director for the American Friends Service Committee and co-author of Marshall Law: The Life and Times of a Baltimore Black Panther; and Marshall “Eddie” Conway, Producer at the Real News Network‘s Baltimore Bureau, former Baltimore Black Panther leader and political prisoner, and co-author of Marshall Law: The Life and Times of a Baltimore Black Panther.